Do you use public computer sometimes? How do you protect yourself while you use a public computer? I know some ways you can do, like take your USB flash drive with some portable programs. Yes, they can protect your private information. But the problem still exist that is you still can not stop someone sniff you, if you want check your email in a public computer, how can you do? No any idea? 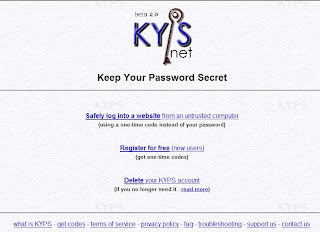 Maybe you can try Kyps that helps you keep your password secret. It offers a code (once time using) for you sign in your account. 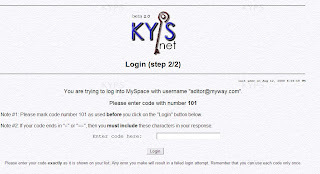 First, you need register with Kyps, it is free but you need assign an email account with it. Now, it supports Hotmail,Live, Yahoo mail, Gmail, Web.de, Gmx, Myspace. Of course, you need offer your use name and password. After that, you will get a sheet of code like this picture below. 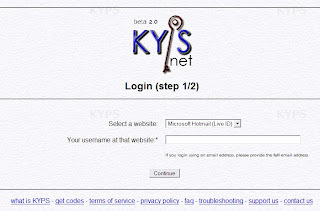 Print or write down your codes, you can use them to sign in your email account via Kyps. Enter your code into the bar, click Login. That is all. If you lucky you can get in your account, but I could not even I waste my several codes. Good lucky if you want try.